Are you having a great party but your pool has changed color? 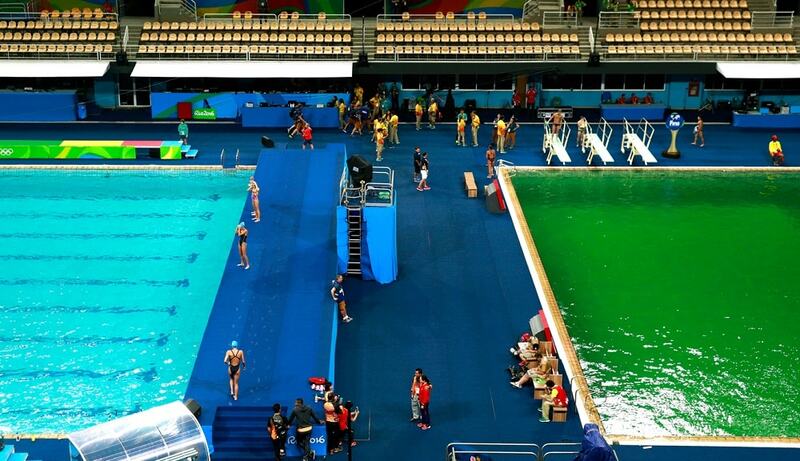 Or are you the type of person who always has green pool water? Does it look like you don’t have a way to eliminate algae from your pool? Well, you have come to right place because I am about to explain how to get rid of pool algae. Algae are microscopic materials or plants of which about 25,000 different species are known to thrive. Of these, there’re a few that love the opportunity to take up shelter in your swimming pool. They aren’t, as a rule, harmful – but they are annoying and quite ugly. The only real harm is that they may, if not thoroughly treated and prevented, became shelters to a secondary infection of a dangerous root killer in swimming pools. Therefore, a pool alga might be a nightmare and understanding how to remove it and prevent it is vital. So, unless you enjoy having noxious colored spots or green pool water damaging your pool, read on. A green pool alga is the most common of all algae and it develops due to insufficient filtration and sanitation. Sometimes, you will see green algae in pool floating which might cause your pool to turn green. You might also see this organism cling at the bottom or to the sides of your pool. The good news about this alga is that it’s very easy to remove it. A stingy form of alga that develops on the walls of your pool in areas that receive minimal sunlight. It is the second most frequent alga (after green pool algae) you will find it in your pool and sometimes might be mistaken for pollen or sand that may have collected in your pool. It is hard to eliminate these algae and will not die due to any ordinary dose of sanitizer. If you have ever experienced yellow algae and thought they were tough to get rid of, think twice. A black alga is the stingiest of all algae, although it doesn’t occur regularly. What makes it hard to eliminate is the defensive system it has and its strong root. Just like yellow algae, these algae occur due to limited sunlight in some spots of your swimming pool. To remove it, you will require lots of shocks and a strong brush. Watch the following video to learn about how to test for algae. Once they have taken hold, eliminating pool algae from your pool might be a complicated process. However, with a little patience and determination, you will be able to eliminate all but the hardest cases effectively. The aim here is to eradicate as many organic substances such as leaves, bugs, and dirt as possible. The organic substance might absorb the impact of the sanitizer (Step Four), so you need to clear it out to ensure that your sanitizer focuses on zapping the algae. Note: Do not brush your pool yet; all that you will do is break and loosen up the algae. That will be in a later step (Step Five). Do you know how to clean pool filters? If you don’t, don’t worry. Here, you will need to backwash the sand filter inside your pool. Ensure that your swimming pool is able to circulate efficiently and cleanly. Check that your pool’s pH is between 7.4 and 7.6. If it isn’t, adjust it accordingly. Algae might thrive between 6.5 and 12.5 pH, but the recommended range allows the chlorine to be effective and maintain the water balance levels. Hence, set the pH level between 7.4 and 7.6. Shock or sanitize your pool with trichlor – one gram/25 liter of water. If you have a dark painted pool, a vinyl pool, or a dark colored plaster pool, be warned that this substance might bleach its surfaces; instead, use liquid chlorine at 30,000 parts per million (ppm). Note: Do not sanitize your pool at midday; UV rays from the sun will reduce the effect of the sanitizer. Begin the process later in the afternoon. Do you know how to clean algae from the pool? You are in luck, this step will teach you how to. Here, your aim is to break the bonds the organism has on the walls or floor. With black alga, you are also trying to destroy its protective outer part (head) so that the sanitizer may get in and destroy the alga and its roots. Note: Make sure that you brush all the areas thoroughly – whether they have or don’t have algae. In addition, brush all pool slides, ladders, and other surfaces. Run your pool filter pump for about 72 hours in order to offer the sanitizer a chance to work effectively. During this step, ensure that you brush the pool walls and surfaces at least once per day. In addition, test your pool’s pH level frequently (once on the 1st day, and then twice every day for the following 2 days) and ensure that the chlorine level is at 6 ppm. Since the filter is going to handle thousands of dead substances, make sure that you clean it regularly so that it doesn’t become clogged. Furthermore, vacuum your pool regularly to remove the dead organism from the base. Finally, continue to brush the wall and surfaces regularly – even if you don’t see any sign of algae. Note: You may revert to your ordinary maintenance after seven hours and when the chlorine levels go back to 3 ppm. Watch this video to learn how to clean algae from your pool. If your pool has serious cases or especially stubborn algae – particularly for black or yellow algae – you might need to apply more aggressive methods. The 1st step if to repeat the steps of removing easy cases algae. Light green algae – If your pool is light green, you will need to double shock it so as to kill the algae. 500 grams of shock treats about 40,000 liters of water. Therefore, if your pool holds about 40,000 liters of water or less, you will require 1kg of shock (2 sachets). If it holds 80,000 liters of water, you will require 2kg of shock (4 sachets), 3kg for 12,000 liters, and so on. Dark green algae – If your pool is dark green, you will need to triple shock it so as to remove the algae. Here, if you have 40,000 liters swimming pool or less, you will require 1.5kg or 3 sachets of shock. 3kg or 6 sachets for 80,000 liters or less, 4.5 kg or 9 sachets for 120,000 liters, and so on. Black green algae – This is the toughest stage of an alga. If you have an alga from the “black kingdom”, you will need to quadruple the shock. Hence, if your pool holds 40,000 liters of water, add 2kg or 4 sachets of shock. For 80,000 liters, add 8 sachets or 4 kg, 6 kg or 12 sachets for 120,000 liters, and so on. These aren’t different types or forms of algae, they simply different amounts. The more organisms in your swimming pool, the darker the color will be. I have come across pools which are dark due to algae infestation. If your pool features a vinyl liner, ensure that you dissolve each ½ kg (1 sachet) bag in its individual bucket of water before adding it to your pool. This will prevent the liner from being destroyed (bleached) due to shock. Don’t pour the substance through the skimmer – shock has calcium hypochlorite which mixes with trichlor in chlorine to form an explosive green gas. Finally, always shock during the night. Chlorine burns off one ppm every hour during the day (sunlight) to run below the required level to kill algae. Floc is a chemical that takes all particles in your swimming pool and settles them to the base. After they have settled, it is your responsibility to vacuum them out of your pool. This method involves more work and might be time-consuming, but it is very effective if done properly. If your pool’s filter contains a multi-port valve, shut off the pump and then turn the valve to recycle or recirculate. This will prevent the water from flowing via the filter. In addition, this helps the water to spin around and thus mix the chemical in. Floc comes in powder and liquid form. Ensure that you read the directions for the recommended dosage for your swimming pool – according to size. Circulate the water for two hours to ensure that the chemical is well mixed, then turn off the pump, and let it settle during the night. Overnight, the chemical will begin to bind the algae together and settle them at the base of your pool. In the morning, you will wake up to a clean pool. Before you switch on the filter, ensure that you set the multi-port to waste. When vacuuming this dirt solution out of your pool, you shouldn’t let it flow through the filter. The filter isn’t strong enough to clear this water which is cloudy, fast, and green (water will simply return to your pool via the return lines). In addition, ensure that you connect the backwash hose to the waste port/backwash and place the pipe where you want the water to go. Add your garden pipe to the pool and switch it on when vacuuming. Since you are removing waste, which will remove a lot of water from your pool, it is ideal to have a garden pipe replacing this water with clean one. This will ensure that your pool gets cleaner faster. Here, you will be removing out the thick and dirty water from your swimming pool, and as you move your vacuum across the bottom of your pool, it is will begin to remove algae. When it becomes too dirty to see what you are doing, shut off the pump and let it settle for a few hours. Then go back and continue to vacuum your pool. You might need to do this a few times depending on how much algae and debris you want to vacuum. With just this simple chemical and a little bit of elbow power, you will have your swimming pool clean within a short time. When you finish vacuuming, double shock your pool to ensure that all algae have been destroyed or removed. There are different methods of how to get rid of pool algae from your swimming pool. The above are just some of the best methods that you may follow to clean swimming pool fast. Don’t forget that ideal maintenance goes a long way to prevent algae development in your pool. Once you have cleaned your pool, ensure that you keep a strict maintenance timetable. If you loved the article, feel free to leave your comment below and share with your friends. I hoped you enjoyed reading it.